A multihull is a ship or boat with more than one hull, whereas a vessel with a single hull is a monohull. Viking ships were marine vessels of unique structure, built by the Vikings during the Viking Age. A scow is a flat-bottomed type of sailboat. During the 19th and early 20th centuries, scows were used to carry cargo in coastal waters and inland waterways, having the advantage when navigating shallow water or serving small harbours. Scows were in common use in the American Great Lakes and other parts of the U.S., in southern England, and in New Zealand. In modern times their main purpose is for recreation and racing. A minehunter is a naval vessel that seeks, detects, and destroys individual naval mines. Minesweepers, on the other hand, clear mined areas as a whole, without prior detection of mines. A vessel that combines both of these roles is known as a mine countermeasures vessel (MCMV). "East Indiaman" was a general name for any sailing ship operating under charter or licence to any of the East India Companies of the major European trading powers of the 17th through the 19th centuries. The term is therefore used to refer to vessels belonging to the Danish, Dutch (Oostindiëvaarder), English, French, Portuguese, or Swedish (ostindiefarare) East India companies. 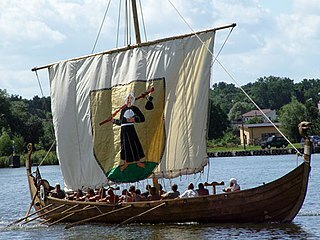 A knarr is a type of Norse merchant ship used by the Vikings. The knarr was constructed using the same clinker-built method as longships, karves, and faerings. 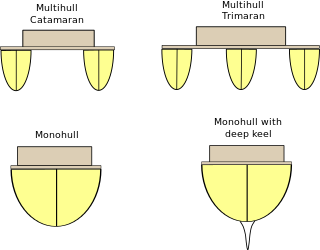 The draft or draught of a ship's hull is the vertical distance between the waterline and the bottom of the hull (keel), with the thickness of the hull included; in the case of not being included the draft outline would be obtained. Draft determines the minimum depth of water a ship or boat can safely navigate. The draft can also be used to determine the weight of the cargo on board by calculating the total displacement of water and then using Archimedes' principle. A table made by the shipyard shows the water displacement for each draft. The density of the water and the content of the ship's bunkers has to be taken into account. The closely related term "trim" is defined as the difference between the forward and aft drafts. The Achelous-class repair ship was a class of ship built by the US Navy during World War II. Beaching is the process in which a ship or boat is laid ashore, or grounded deliberately in shallow water. This is more usual with small flat-bottomed boats. 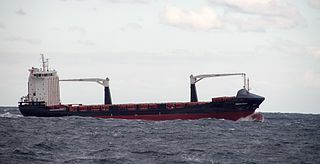 Larger ships may be beached deliberately, for instance in an emergency, a damaged ship might be beached to prevent it from sinking in deep water. Some vessels are designed to be loaded and unloaded by beaching; vessels of this type used by the military to disembark troops under fire are called landing craft. A koff is a historical type of sailing vessel that was used for coastal shipping off Belgium, the Netherlands, and Germany in the 18th and 19th centuries. A typical koff had one and a half masts with a gaff rigged main sail and spanker and one or two square sails in the main top. The hull was plump with a flat bottom and a heavily rounded, raised bow and stern. Smaller koffs could be equipped with leeboards. Due to the shallow draught, koffs were especially suited for inshore shipping in shallow waters. Karakoa were large outrigger warships from the Philippines. They were used by native Filipinos, notably the Kapampangans and the Visayans, during seasonal sea raids. Karakoa were distinct from other traditional Philippine sailing vessels in that they were equipped with platforms for transporting warriors and for fighting at sea. During peacetime, they were also used as trading ships. Large karakoa, which could carry hundreds of rowers and warriors, were known as joangas by the Spanish. Garay were traditional native warships of the Banguingui people in the Philippines. In the 18th and 19th centuries, they were commonly used for piracy by the Banguingui and Iranun people against unarmed trading ships and raids on coastal settlements in the regions surrounding the Sulu Sea. The name means "scattered" or "wanderer" in the Sama language of the Banguingui. Lepa, also known as lipa or lepa-lepa, are indigenous ships of the Sama-Bajau people in the Philippines, Malaysia, and Indonesia. They were traditionally used as houseboats by the seagoing Sama Dilaut. Since most Sama have abandoned exclusive sea-living, modern lepa are instead used as fishing boats and cargo vessels.